Electronic outside PC cabinet. only one RS232C Serial on PC is required free for interface. 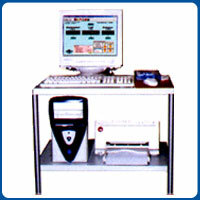 It is having advantage of Ease of Commissioning, Maintenance, Calibration, Trouble shooting etc. No any specification requirements of PC cabinet size, nor any ISA or PCI free slot required. Reduced PC related problems, failures etc. Auto communication port detection on PC. Any latest PC with windows 98/XP installed can be used. Graph Comparison, point tracing on Graph, Selection result printout. 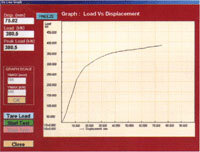 Graph Zooming, Scaling, Different units selection for Load & Displacement. Test certificate & Single graph Printout. Any printer is suitable. 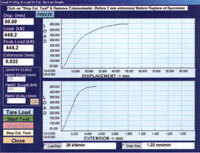 EE01 (for EE2 extensometer), TT01 (for Torsion test). 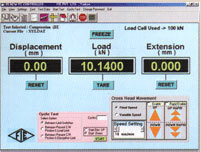 20,000 load counts in 3 ranges (0-20%, 20-40%, 40-100%). 0.01mm Displacement resolution standard for UNITEK Machines. 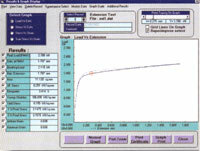 0.1mm Displacement resolution standard for UTE Machines. on PC. Proof stress, youngs modulus calculation. Overload protection for full scale load. Additional Safe load entry for better protection. 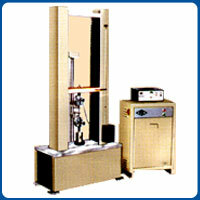 Following features are applicable only for UNITEK Machines. 2,000 Drive rati, with precision DC Servo Motor & Drive. Wire connected REMOTE for easy Loading/Unloading of specimens. Limit switch protection on both sides of Cross Head Travel. Watch dog safety to avoid malfunction. 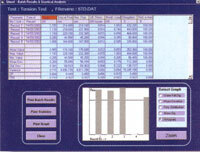 With EE2 extensometer, EE2 hardware & EE01 software is necessary. There will be only power on switch & LED on external panel, All machine connections will be from this external panel. There will be only serial cable connection from panel to PC. For UTE Machines Control Valve & Release Value operation is manual. PC & its accessories are not in standard of supply.